"One of the best small charities in the Greater Washington, DC region"
Volunteers Needed: NoVA Outside is seeking volunteers to join our leadership team. If you have a passion for outdoor education and skills in the areas of communications, fundraising, event planning, or social media, please email us! If you'd like us to include your news or event, please email us. 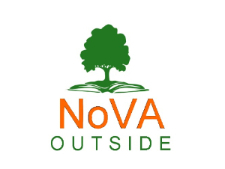 NoVA Outside is the only organization in Northern Virginia focused on providing educators with professional development opportunities in environmental literacy and outdoor learning. As a local organization, our efforts have immediate impact within our community. Registration is open for the NoVA Outside School Environmental Action Showcase (SEAS) at the Center for the Arts on George Mason University's Fairfax campus on Tuesday, April 25, 2017. General showcase (all grades) – bring up to 10 of your eco-leaders and a display to show what your school is doing to be environmentally friendly. High School Track (grades 9-12) – Network with GMU students and staff during STEM career sessions and visit the mobile Thinkabit lab to learn about how engineering and the environment connect. Smart Cities Research Tools (grades 9-12) – The Virginia Tech Thinkabit Lab provides hands-on experiences using microcontrollers, sensors, actuators, and servo motors to explore new ways to collect environmental data. SEAS Partner Village (K-8) – Have fun engaging in hands-on STEAM activities from local, state, and national government agencies, non-profits, and businesses. By registering for the General Showcase, students in elementary and middle school will automatically be registered for the Showcase and Partner Village. Students in high school will automatically be registered for the General Showcase, High School Track, and Smart Cities Research Tools. Participation in the SEAS Music Festival and Caring for Our Watersheds is optional. Register your school at https://goo.gl/pyeJeS by Friday, April 7. Register your organization to host an activity at https://goo.gl/X2xvHd by Friday, April 7. All are welcome to stop by and learn about the amazing stewardship projects underway at Northern Virginia schools. Have questions? Interested in hosting a hands-on activity as a partner? Email showcase@novaoutside.org. Interested in environmental education? NoVA Outside's School-Age Green Educator's (SAGE) Committee has some upcoming meet-ups that we would love for you to attend! See outdoor learning, gardening, and other eco-projects at local elementary, middle, and high schools. Talk to the people who are making environmental education happen! Meet-ups are 4:30-5:30 the first Wednesday of each month from October through June. Contact Trish Wotowiec to sign up for the SAGE Meet-up email list or apply to host a meet-up at your school. 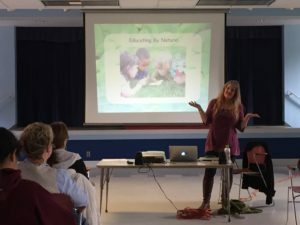 On March 25, the Early Childhood Committee of NoVA Outside organized the “Getting Kids Outdoors in Nature” conference at the Fairlington United Methodist Church. The conference brought together educators in varied roles from the usual mix of early childhood programs, all interested in learning more about nature education. In her keynote address, Outdoor Education and Nature Connection Specialist Amy Beam encouraged us to let children take risks that help develop their gross motor skills and their confidence in their own problem-solving abilities. The examples she brought of the many different materials she and the children take with them on their long walks through natural areas helped us plan for our own programs. In her breakout sessions Beam taught fun activities, games, songs and techniques that awaken and deepen children’s innate love of nature and learning. Directors Debbie Brown, Susan Parker, and Margaret Moran lead half-day parent co-op programs with classes that spend days each week entirely outdoors on “field trips” in partnering local parks. They talked about the on-going process to educate parents and other family members on the benefits of outdoor experiences that take place off the playground. 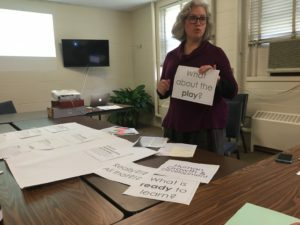 Lesley Romanoff, also the director of a half-day parent co-op program, has found that play gets a child closer to “ready to learn” than anything else, but adults/parents need to see that teachers are checking off the boxes of curriculum and standards. She advised directing attention to the value of play and playful learning by documenting and explaining to parents how nature play does more than check all the boxes. For educators who plan to incorporate more time in natural areas, Romanoff recommends to “start small." Alonso Abugattas, Arlington Parks Naturalist and Capital Naturalist blogger, advises us to be flexible and use the “interpretive moment” to teach about whatever in nature has children’s attention. His enthusiasm for small wildlife was infectious: “Those millipedes are so cool!” making me excited about searching for them. If you have difficulty locating small animals like millipedes and isopods, use his technique of putting a board or old door down on the ground. After a few days, open this “Door to the Underground” to reveal millipedes, isopods, slugs, worms, and more. Remember to check for yellow jacket wasps first, since they may be nesting. Naturalist Sarah Glassco says a school garden is great for getting kids outdoors and attracting wildlife. Many programs do not have access to a natural area so a garden is a good place to experience nature. She brought a mini-library of her favorite resources so participants could become familiar with them and research their nature observations when she took the group outdoors. In every session, participants shared their successes in teaching children in outdoor settings and problem-solved how to work through the hurdles that keep us from teaching outdoors. After the sessions we gathered for lunch and casual discussions. Lunch and networking, two very important experiences for early childhood educators that we often don’t get time for! Join thousands of volunteers at hundreds of cleanup sites around Fairfax and the DC Metro area and remove litter from the Potomac River and the many small tributary streams that flow into it. The cleanup's many day is Saturday, April 8th, but events will be held throughout the month, and some even in late March. A list of cleanup sites looking for volunteers is available on the Alice Ferguson Foundation's Potomac Trash Network website. Check out the site map and join the 29th Annual Potomac River Watershed Cleanup. Most of the cleanups are scheduled on Saturday, April 8, but there are additional cleanups scheduled on every Saturday and Sunday throughout the rest of April. Join Friends of Dyke Marsh to help clean up Dyke Marsh. Check in at the Haul Road entrance or Belle Haven Park. Wear study shoes and gloves. Come spring and view the spectacular display of Virginia Bluebells that carpet the floodplain along Cedar Run for nearly a mile. This is also a wonderful opportunity to learn more about Merrimac Farm Wildlife Management Area and meet local environmental organizations and people who are working to improve our community. A series of naturalist led tours will follow an easy one-mile walk through the floodplain. Each tour has a special focus, although leaders cover all interesting sights. Local organizations will share displays and activities for children of all ages. Check online at pwconserve.org for the tour schedule and list of participating organizations. A bake sale and a hand-painted rain barrel raffle to benefit stewardship projects at Merrimac Farm round out the event. Concessions and food will be available for purchase. Bring binoculars, cameras, and the kids, and come out to join us for a day of fun! This event is free of charge. Sponsored by VA Dept. of Game & Inland Fisheries and Prince William Conservation Alliance with support from Marine Corps Base Quantico. Rain barrels purchased from retail sources can be expensive. As part of a regional initiative, NVSWCD offers build-your-own rain barrel workshops and distributes low-cost rain barrels to Fairfax County citizens. You will learn how to install and maintain a rain barrel and take one home! The fee per rain barrel is $55 for build-your-own workshops. Click here to register online. In celebration of Earth Day, please join Arlingtonians for a Clean Environment (ACE) for a screening of the film, "This Changes Everything," featuring international author and activist Naomi Klein in a story that re-imagines the vast challenge of climate change. Directed by Avi Lewis, and inspired by Naomi Klein’s international non-fiction bestseller This Changes Everything presents seven powerful portraits of communities on the front lines, from Montana’s Powder River Basin to the Alberta Tar Sands, from the coast of South India to Beijing and beyond. Doors open at 6:30 pm and the film will start at 7:30 pm. The suggested donation for this event is $10 per person ($5 for students). Anyone under 21 must be accompanied by an adult. The donation is payable online or at the door. All proceeds benefit ACE's local conservation efforts. Reserve your spot today! Celebrate Earth Day by learning about raptors like barn and barred owls, hawks and more close up at Belle Haven Park. See live raptors that were injured and have been rehabilitated, but cannot survive on their own. This event is sponsored by Friends of Dyke Marsh, the Raptor Conservancy of Virginia and the National Park Service. This is a great event for kids of all ages. The event is free to all. For more information, see www.fodm.org. A discussion will be led by Catherine Zimmerman, Producer/Director, The Meadow Project. https://themeadowproject.com. See a movie trailer here. The event is free, no RSVP needed. For general information, call Kit Britton at 703-522-1114. Contact Bob Blinn at 804-836-3704 to reserve free child care. This event is open to all. Visit www.pwcgov.org/trashandrecycling for additional details. Clean Fairfax and the Fairfax County Park Authority present SpringFest, Fairfax County's official Earth Day and Arbor Day Event. Join the fun with over 75 vendors, exhibitors and food trucks. Learn about the great work County Parks do; pet an alpaca; try a fun run; participate in environmental crafts; check out the bees and the trees; consult with Master Gardeners; buy plants for your garden and MORE! Admission is free. Learn more here. Rod Simmons, Natural Resources Manager for the city of Alexandria, will discuss the varied geology of Northern Virginia. Looking for some native plants for your garden? There are several native plant sales coming this spring. Wondering why you should plant natives? Jessica Bowser wrote this article, "Turn Your Yard into a Wildlife Sanctuary… Plant NoVA Natives" for Plant NoVA Natives. The seasons are changing, the temperature is rising and homeowners are cleaning up their yards and making plans for improvements in their landscapes and gardens. The plethora of plant options at the garden centers can seem overwhelming and there are many factors to consider to ensure that the plants you choose will survive and thrive in your yard without intensive maintenance. There is an option that will add beauty and sustainability to your yard, attract wildlife, positively impact the environment and is easy to maintain…Native plant species. Native plants are perfectly adapted to our local environment. 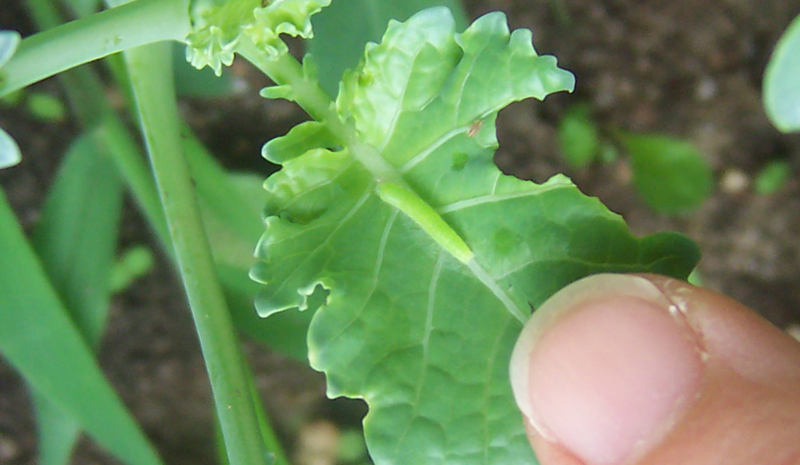 They will thrive in our soil conditions without needing special fertilizers, pesticides or extensive watering. They are hardy plants that will last once they are established in your yard and will attract birds, butterflies and other pollinators for years. Native plants have colorful blossoms, berries and bright foliage throughout the seasons. The natural beauty of native plants raises property value, conserves water and will make your yard attractive for years to come, but that’s not all. Native plants do more than save you time and money. They are good for the environment too. Development in Northern Virginia has eliminated many natural areas with plant species that are needed to maintain a healthy ecosystem. Non-native species have been introduced that interrupt the natural cycle, including invasive plants that can destroy ecosystems. Insects, birds and bees all rely on native plants for food and habitat. Planting native species in your yard will contribute to the restoration of our delicate ecosystem while supporting our environment. Your yard can become a sanctuary for pollinators and other wildlife! Ready to get started? Plant NOVA Natives is a local organization that promotes and supports the planting of native species. Their website has everything you need to help you choose the right species for your yard. They also provide information on garden centers and local native plant sales. Are you looking for personalized support? Plant NOVA Natives has partnered with organizations such as Audubon At Home, who will come to your home at no charge and help you choose plants that are well-suited to your yard. Real Food for Kids Healthy School Advocacy Training is designed to help you foster a more robust and engaged culture of health at your school by turning your passions into an Action Plan. This highly interactive training is for parents, educators, staff members interested in elevating the culture of health in their schools. Leave with an Action Plan! We'll start this training by identifying the issues you'd like to tackle – that way we can put the workshop content into context and empower you to build an Action Plan for when you return to your school. We'll send you back with actionable strategy, tools and resources to accomplish your goals – plus a network of like-minded advocates from your training and support from the Program Team at Real Food for Kids. The fee of $15 covers materials provided to you for this training. Register at Eventbrite. To ensure a level of individualized attention, registration is limited to 15 participants. Register today to ensure your seat at this training! There is a new movement afoot in communities across North America. Communities are coming together to remove unwanted pavement and creating vibrant green spaces. The hands-on depaving process captures the hearts and energy of volunteers who work together to make schoolyards and neighbourhoods more livable and resilient. In her presentation, Alix will tell us more about the depave movement, and indicate what one needs to get involved in this important greening initiative. Register here. This webinar is provided by Green Teacher. The annual Outdoor & Experiential Educators Workshop is open for registration. This year's host is Congressional School in Falls Church, Virginia. The workshop provides a space for Virginia, D.C., and Maryland educators to discuss programs their schools run that get students adventuring outdoors. It is a great day of information exchange among colleagues. And… it's FREE! For more information and to see past workshop subjects, visit the website. Please join your outdoor colleagues for a full day of information. If you wish to be a speaker, contact Lynda Hoag. The workshop is very casual and the coffee will keep flowing. This workshop is sponsored by Flint Hill School. Students grades 8-12 are invited to this educational and rewarding experience at the ninth annual Students for Sustainability Conference (S4S): "An Evening for the Earth." Bring a green delegation from your school to be part of this afternoon where art expresses a concern for the well-being of the natural environment. The conference will highlight student creative work and performances as well as workshops with regional artists passionate about the environment. Students from Maryland, Virginia, and District of Columbia schools are welcome to lend their energy and enthusiasm and take home new knowledge and inspiration to their schools. Conference details and registration information can be found on the Students for Sustainability Conference website. Cost is $20 per student. Questions? Contact Brian Kane, SSSAS Director of Environmental Stewardship, at bkane@sssas.org or (703) 212-2912. Registration is now open for the 2017 Smithsonian Science Education Academies for Teachers! The Academies provide teachers with an opportunity to take part in a week-long professional development course behind-the-scenes at Smithsonian museums and other world-class research facilities throughout the greater Washington, DC area. The Academies help to bridge the gap between the formal science education programs the Smithsonian Science Education Center offers and the informal science education that exists throughout the Smithsonian. The Academies combine training in science pedagogy with content presented by scientists and researchers who are experts in their fields. Population Education, in partnership with the University of Missouri-Kansas City, is excited to announce that registration is open for our spring 2017 online professional development course for science and social studies educators (grades 6-12). Discover student-centered learning strategies that use contemporary issues and real-world data to examine the social and environmental impacts of human population growth. For more information and to register, visit https://courses.populationeducation.org/. The Water ECubeG RET Site provides a unique interdisciplinary research experience funded by the National Science Foundation (NSF) that integrates water research perspectives from engineering, ecology, environmental science, and geosciences, giving a holistic understanding of environmental monitoring and water/watershed related issues for teachers of students in grades 9-12 and community college. During the program the teachers will participate in a 6-week research project, professional development activities, and develop learning modules/activities in their subject area, which will be included in their taught courses the following year. The 6-week research experience will include $5500 stipend, an iPad, travel and subsistence allowances, continuing education credits (CEUs) from Virginia Tech. For more information, contact Dr. Vinod K. Lohani at vlohani@vt.edu or 540-231-0019. The Student Climate & Conservation Congress (Sc3) is a week long leadership training event for high school students, held annually at the U.S. Fish and Wildlife Service's National Conservation Training Center in West Virginia. Students spend a week studying and discussing environmental, social, and economic interconnections to address climate change and conservation challenges affecting their generation – all while connecting with nature and new friends. Financial aid/scholarships are available. Cost is only $950 if you apply by March 15th. Students – apply today! Space is limited. Teachers – Nominate students to represent your school at Sc3! Learn more here. Download and share the flyer or brochure with students you know who may be interested. The Annual CELF Summer Institute in Education for Sustainability (EfS) is an intensive 4-day workshop that enables teachers to integrate the concepts of sustainability into their existing curricula. The Institute equips K-12 teachers with practices and teaching methods to address the core concepts of EfS – the intersection of social, economic, and ecological systems – and how the balance of those three systems is vital to a sustainable future, and relevant to all subject areas. Each Institute begins by building a learning community and a common vocabulary around sustainability, and progresses with hands-on activities, case studies, guest presentations, evening excursions and field work. The schedule includes supported planning time so that participants will have tangible materials to bring back to their classrooms. Register and learn more at celfeducation.org. Register by May 1 for early bird rates. 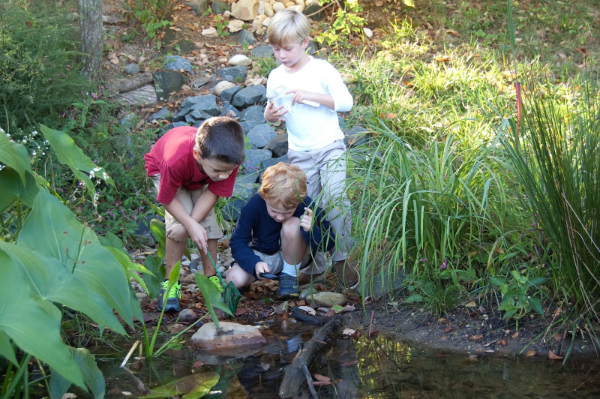 The Living Earth School, a nature-based educational education organization in the Charlottesville area, is offering a wide array of educational experiences for kids and adults for the 2017 season. Adult programs include Wild Mushroom Foraging, Wild Edible Plants, Leather Working, and more. Youth programs include once a month programs, weekly homeschool programs, family programs, and summer camps. Learn more about the available programs at http://livingearthva.com/. 1.2 kilowatt photovoltaic system that converts sunlight into electric power, often referred to as "solar on a stick"
Virginia SOL focused solar curriculum and hands-on kits that will teach students how solar works and how energy, the environment and economics are all part of energy decision making. Please visit easternridgeschool.org/careers for more information. Whitehall Farm in Clifton, Virginia is seeking a part-time volunteer Farm Educator. Ideal candidates will have a teaching background, or environmental educational experience and a passion for teaching and working with children. The Farm Educator assists with school-aged field trips, facilitates the parent-child program for young learners, and in the future could develop the outreach program and be a facilitator for a summer farm camp. Located in Fairfax County 10 minutes from George Mason University, the 200+ acres of Whitehall Farms, LLC offers picturesque woodlands with local wildlife, forested streams, and rolling pasture. Whitehall Farms produces a variety of high-quality farm products including fruits, vegetables, grass-fed meat, eggs, honey, and firewood. An integral part of our farm are the field trips and parent-child educational programs offered in the spring, summer, and fall. Field Trips are standards-based, theme-based field trips for school-aged children (pre-K to 12 grade) from local schools, scouting troops, etc. Students participate in hands-on, experiential learning in an authentic farm setting. Parent-Child Programs are Friday mornings at 10.00 am. Our innovative parent-child program combines a hands-on farm activity with parents and their young children, and listening to a story highlighting the class subject or farm area. Parents/guardians and young children (ages preschool to 8 years) are welcome. The Farm Educator is currently a volunteer position. Compensation can be negotiated depending on the situation. Friday mornings for approximately 3 hours, plus weekday field trips depending on availability. Potential to develop our farm education and outreach programming based on your interests. Applications will be considered on a rolling basis until position filled. – Looking for some guidance on outdoor classroom design? Nature Explore is a great resource that offers design services, educator workshops, and natural products. – Interested in buying some "fall color" themed native plants for your garden? NVSWCD is accepting orders now for the 2017 Native Seedling Sale. – Want happy kids? More experiences and less stuff may be the key. – The Green Schools Alliance has launched a new website for collaborating and resource sharing. Check it out at www.greenschoolsalliance.org. – Earth Sangha's Native Plant Schoolyard Garden Kits with pre-selected plant lists for four different habitats are available to all NoVA schools now. – Work for a school or nonprofit? Gardener's Supply offers you 25% off on all products! Use source code KGO2017 and Gardener's Supply will donate 15% of proceeds to KidsGardening. – Green Spring Gardens offers field trip opportunities year round. Updated curriculum better accommodates changing Virginia SOLs! – Learn about using EarthLoom Projects in the Weaving a Life Leadership Training. Copyright © 2016 NoVA Outside, All rights reserved. NoVA Outside is a fiscally sponsored project of United Charitable Programs, a registered 501(c)(3) public charity. Terrific day at #novaseas19 with 500+ students from 50 schools! More pics in stories! NoVA Outside is pleased participate in the Nickels to Nonprofits program with Northern Virginia Whole Foods Market locations through June 30. Simply bring your own bag and tell your cashier to donate the 5-cent credit to NoVA Outside! It's that easy! Lots of creek exploration and water play at Arlingtonpalooza! Copyright © 2010-2019 NoVA Outside. All rights reserved.